It's voting time at the Sandusky Register! That means choosing the 'Best Of' in your area. 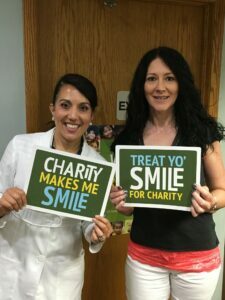 We strive to offer the best dental practice, best patient care, best random acts of kindness. Being the best of, reminds us of being the best of ourselves. Putting our best forward. Do we give the best of ourselves at home, work and with our communities? Although we love and appreciate nominations for best dental practice---we know the real practice of 'best of' is our everyday patient care. Did we show concern? Did we treat our patients with the best clinical care, knowledge and best practices? Did we smile? Did we show passion in our care? Did we show that we love what we do? Did we listen and did we respond with clarity and compassion? That's our measure of 'best of.' So yes, vote on. Vote for Stefano Dental. But we hope our 'real' vote comes through successfully treating our patients, getting a patient referral or just hearing a thank you, because a patient is finally comfortable smiling, when they weren't before because of misshapen or diseased teeth. One of the reasons we encourage continuing education with our staff is that we want to stay current with our best dental practices. It's important that we educate and offer our patients with the latest technological advances and equipment to better serve their needs. Thank you for voting. We're voting for all of us to be the 'best' we can be!